Theme music by Bknapp. Please subscribe and leave a review for the show in iTunes or Stitcher. Richard Clark, SD Kelly, DL Mayfield, and Tyler Glodjo joined up to form the CAPC 25 council, setting this year’s list in stone. 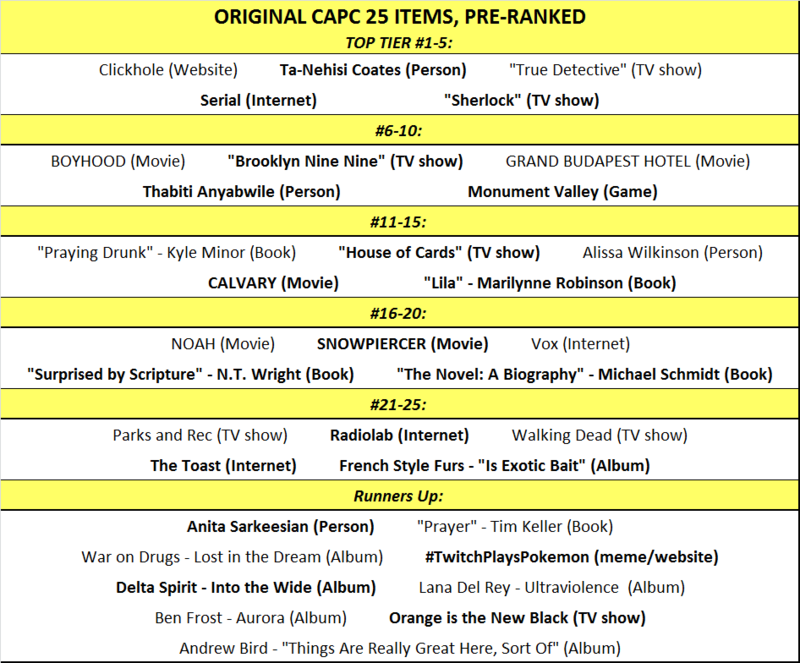 In part 1, the council ranked items 16 thru 25. Hear their reasoning, along with a peak at which items are being considered higher up the list. Here’s how the list originally looked before the council got their hands on it. Cray Allred is a wandering English major who works in technical writing by day. By night, Cray is a freelance writer and podcast producer for outlets covering sports, faith, and music. He co-founded Sunday Oldskool, a podcast dedicated to helping Christians better understand and engage the realm of hip hop. He spends the rest of his time feeling undeserving of his beautiful wife and daughters, being loved and fed at his church, and vicariously balling via an over-consumption of hoops and hip hop. In Can a Scientist Believe in Miracles, Ian Hutchinson faces the prodding of scholars and Christians alike, holding faith up to academic inquiry and in turn guiding Christians into more detailed understanding of the world.